we built the Naomh Beagnait and rowed her across to Dalkey Island on June the 1st. The build crew included local residents and people who use Coliemore and Bulloch harbour for work and play. Many thanks to Dalkey Rowing Club for allowing us to use their workshop when no siutable public spaces were available in Dalkey. Without their generous help the Naomh Beagnait would not have been built, and Dalkey would be the poorer without the project. The boat was blessed at least twice! She is heading to Cork tomorrow to take part in the 'Ocean to City Race', and will return to Dalkey next week. 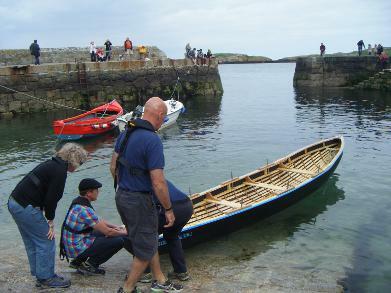 Two hand built currachs made by volunteers from Dalkey will be launched from Coliemore harbour and rowed across to Dalkey Island to highlight the myriad links between the island and the town.The landscape of Dalkey Island has a unique record of human presence from Mesolithic times. Being so close to shore it is a constant reminder of our maritime heritage and the rich layers of history still accessible today. The boats will be carried from the ruins of Saint Begnet's church on Castle Street to Coliemore harbour. They will be named Naomh Beagnait 1 agus 2.
to find a boat builder, a shed, a team of volunteers and funding to help make the vision a reality. The journey will have people working shoulder to shoulder building a traditional Irish craft. It will be a focal point in Dalkey for the month of May as the boats take shape. After the project is over they will be donated to a local community group for their enjoyment. Begnet, or Becnat, patron of Dalkey belongs to that rank of early Irish Saints about who we know very little of their personal lives, but whose cults have survived to the present day. She is recorded in the eleventh-century genealogies of Irish saints as becnat daughter of Colmán, son of Āed, possibly a member of the aristocratic family of Dál Messin Corb who ruled over north and central Leinster up to 700A.D. When they lost control of these territories, their rule was confined to the Wicklow Mountains but they maintained control of some of the most important ecclesiastical offices in Leinster due to the fact that St. Kevin ( Cóemgen) of Glendalough was also a member of the Dál Messin Corb. Becnat, and her churches in Dalkey and Dalkey Island, belonged to the familia Coemgeni ‘the family of Cóemgen and her churches were ultimately under the protection of the great monastery of Glendalough.